Sadio Mane's 93rd-minute winner moved Southampton up to third in the Premier League as managerless QPR suffered a fifth straight defeat. The Senegal midfielder turned Nedum Onuoha to fire into the top corner. QPR, led by academy coach Chris Ramsey after boss Harry Redknapp resigned on Tuesday, remain in the bottom three. Jose Fonte hit the bar in the first half for Southampton, whose left-back Matt Targett was taken to hospital with a head injury. The England Under-20 defender, in the starting line-up because Ryan Bertrand was suspended, needed seven minutes of treatment on the pitch after being left motionless an aerial collision with QPR winger Matty Phillips. Manager Ronald Koeman, though, later confirmed that Targett had suffered no serious damage. Koeman's side were good value for their fifth successive away victory, against a Rangers side who created few clear chances, although substitute Mauro Zarate had a goal disallowed after Mane scored. Sadio Mane has scored in each of his last four Premier League starts for Southampton - against Crystal Palace, Chelsea and Arsenal. Tim Sherwood, who is expected to be Redknapp's permanent replacement, was not at Loftus Road to witness a game that suggested QPR have a lot of work to do if they are to remain in the Premier League. Stand-in boss Ramsey attempted to freshen up QPR's side by giving Adel Taarabt - dismissed as not fit enough to play by Redknapp earlier this season - only his second league start of the campaign. The Moroccan midfielder showed some neat touches, including a clever nutmegging of James Ward-Prowse, but was largely well policed by Victor Wanyama and was substituted after an hour. Eljero Elia, who scored his first two Southampton goals when they won their last away game at Newcastle on 17 January, nearly embarrassed Rob Green early on, chipping wide from Wanyama's pass with the Rangers keeper out of position. Queens Park Rangers have kept just four clean sheets all season, and none in their last six matches. The visitors had the best first-half chances, with Fonte coming closest as he volleyed Ward-Prowse's corner against the bar from eight yards. Mane had tested Green before that, and steered a shot wide after running in behind Clint Hill later in the half. Rangers created more openings in the second half, with Zarate steering a shot straight at Fraser Forster after Nathaniel Clyne failed to clear Phillips' cross. Forster then reacted superbly to flick over a Joey Barton shot that was deflected off QPR's 13-goal top scorer Charlie Austin. But Mane, playing his second Saints game since returning from the Africa Cup of Nations, capped an excellent performance with a stylish winner. Southampton boss Ronald Koeman on Matt Target's head injury: "Everything is now under control. He will have a headache but nothing more. That's good news." On his side's performance: "I think we played well. We played good football and we had the best chances in the game. We were maybe lucky that Fraser Forster made that great save 10 minutes before the end, but I think the better team won today." QPR caretaker-manager Chris Ramsey: "If I'm honest, I felt we rode our luck a bit in the first half. But the defeat was very difficult to take. "It gives a lot of hope to the owners and fans to see that the players are trying their best to keep us in the division. We had some good spells of play, but we really need to tighten up on the quality of our passing and our creativity in the final third." Match ends, Queens Park Rangers 0, Southampton 1. Second Half ends, Queens Park Rangers 0, Southampton 1. Fraser Forster (Southampton) is shown the yellow card. Offside, Queens Park Rangers. Mauro Zárate tries a through ball, but Nedum Onuoha is caught offside. Goal! Queens Park Rangers 0, Southampton 1. Sadio Mané (Southampton) left footed shot from the centre of the box to the top right corner. Assisted by Maya Yoshida. Attempt missed. Mauro Zárate (Queens Park Rangers) right footed shot from outside the box is just a bit too high. Assisted by Clint Hill. Offside, Southampton. Maya Yoshida tries a through ball, but Dusan Tadic is caught offside. Offside, Queens Park Rangers. Nedum Onuoha tries a through ball, but Charlie Austin is caught offside. Mauro Zárate (Queens Park Rangers) wins a free kick in the defensive half. Substitution, Queens Park Rangers. Eduardo Vargas replaces Richard Dunne. Delay in match Richard Dunne (Queens Park Rangers) because of an injury. Attempt missed. Steven Davis (Southampton) right footed shot from outside the box is high and wide to the right. Assisted by James Ward-Prowse. Delay in match Steven Caulker (Queens Park Rangers) because of an injury. Attempt blocked. Sadio Mané (Southampton) left footed shot from the centre of the box is blocked. Assisted by Eljero Elia. Charlie Austin (Queens Park Rangers) wins a free kick on the right wing. Morgan Schneiderlin (Southampton) is shown the yellow card. Corner, Queens Park Rangers. Conceded by Fraser Forster. Attempt saved. 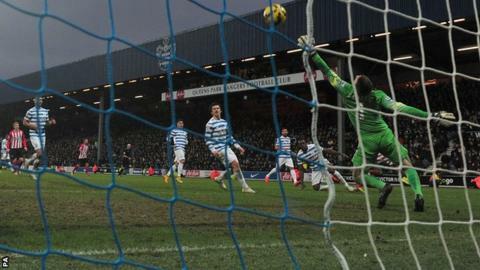 Charlie Austin (Queens Park Rangers) right footed shot from the centre of the box is saved in the centre of the goal. Assisted by Joey Barton. Attempt blocked. Joey Barton (Queens Park Rangers) right footed shot from outside the box is blocked. Assisted by Steven Caulker with a headed pass. Substitution, Queens Park Rangers. Mauricio Isla replaces Armand Traore. Corner, Queens Park Rangers. Conceded by Maya Yoshida.